A family favorite in my house is definitely cupcakes. No question! Since I bake a LOT, I definitely try to make sure that I balance the number of insanely calorie laden unhealthy treats with ones that are as good for you as they taste. This recipe for fruity pebble cupcakes definitely falls in the second category. In the bowl of your mixer, add cake flour, baking powder and granulated sugar and mix on low. Next add in butter substitute and coconut milk and blend until well mixed. Add in vanilla extract and olive oil and mix well. Turn off mixer and fold in egg whites. Lastly, whisk in fruity pebbles. Using an ice cream scooper, scoop mixture into cupcake liners. Bake cupcakes for 17-21 minutes or until toothpick inserted in the center comes out clean but DON'T OVERBAKE. Because these cupcakes don't have any egg yolks, they have a tendency to dry out faster. Remove cupcakes from oven and allow to cool on cooling rack. While cupcakes cool, add cup of butter substitute to bowl of mixer and slowly add in powdered sugar, coconut milk and vanilla extract then slowly increase speed of mixer and beat until well mixed buttercream is formed. Pipe buttercream on top of completely cooled cupcakes. 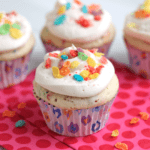 Sprinkle tops of buttercream with fruity pebbles and serve.